Today marks one hundred twenty days since my fiancé, Rob, died. That number is not particularly significant for me, but today is a significant day, because this afternoon I brought his ashes home. I wasn’t sure how I was going to feel about it—whether it would be sad, or weird, or comforting to have the remainder of his physical body in our home. It’s been seven months and two days since Rob was last in our home. Numbers become important in the wake of the loss of a loved one. 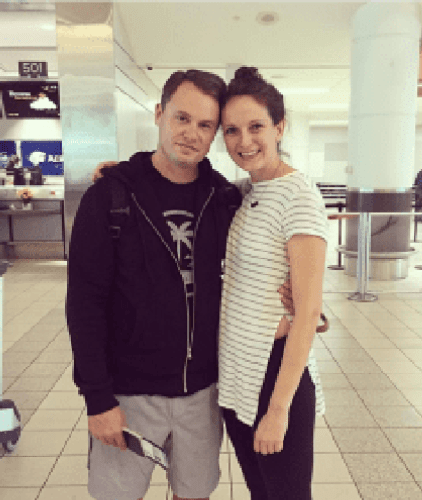 On October 12, 2016, Rob’s thirty-seventh birthday, we left Toronto for our “trip of a lifetime.” Rob had enrolled in a four-over-five program through his job, living on three-fourths of his salary for four years, so that in the fifth year, he could take a sabbatical and still receive eighty percent of his salary. My work graciously accepted my request for a four-month unpaid leave, and we planned a trip that would span seven countries over ninety-eight days. My dream was to go to India, while Rob had visited Thailand seven years earlier while on vacation from a teaching job in Korea, and had been itching to get back ever since. I couldn’t believe that it happened to us. It was such a tragic story, it was almost embarrassing. When Rob died, it sounded like the worst thing I’d ever heard. A happy couple leaves their workaday lives behind to take an improbable, amazing three-and-a-half-month trip through Southeast Asia, gets engaged at sunset on a boat in Ha Long Bay, Vietnam, and then a little over a month later, he dies suddenly in the night, in a small town in Laos. I couldn’t believe that it happened to us. It was such a tragic story, it was almost embarrassing. We had an appointment booked to check out a wedding venue the day after we got home. We had made an initial list of wedding invitees on my phone one muggy night in a riverside bar in Battambang, Cambodia. I had a day of wedding-dress shopping booked with my mum, sister, and best friend for the following Saturday. Instead, I spent that day with Rob’s family at the church in their neighborhood, picking out hymns for his funeral. It’s easy to feel jaded when something like this happens. To feel ripped off. Like the worst thing in the world has happened to you, and you don’t know why. And I still feel like that. Rob’s death still feels extremely unfair. But I made a decision a few weeks ago: I don’t want to win the Worst Life Competition. Because there’s no prize for having the Worst Life—or if there is, it’s a really crappy one. I’ve met other people over the past few months who have gone through similar tragedies, and I’m so inspired by them. By the way that they keep going, and find love and grace and strength in their lives. I’m inspired by the people that I already knew, who have gone through tragedies of their own of all different kinds, who have shown me that going through something terrible really does make you a deeper, kinder, more empathetic person. I’m back in Toronto now. I’m back in our home, back at work, back into my regular routine. Everything is the same, but everything is different. Now Rob is home too, and it feels sad, and weird, and comforting.